One-Point is thought of as a point within the abdomen, several inches below the naval. The Chinese know it as the tan-t'ien, the "sea of ch'i." The Dugum Dani of New Guinea talk of the edai egen, or "seed of singing," as the source of life power at the center of the body In English we talk of someone with spint and fortitude as having "guts." In Japanese, this point is known as the hara\ the center of life and spiritual energy, a point-source of light and ki. 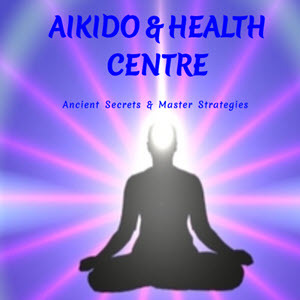 In keeping with the Japanese tradition, the Aikidoist thinks of One-Point as the central point. We drop weight underside, to One-Point. We relax, focusing on One-Point. We extend ki from One-Point. An attack and a reaction both have a rhythm and a beat. Since Aikido movement begins at the One-point and is detected by the One-Point, Aikido technique has a music, a rhythm of its own. Susan Chandler, Sensei whose workshops emphasize music and rhythm, thinks of One-Point as the "conductor" of the music of the body. On the mat, we constantly test for One-Point. From the strictly physical standpoint, One-Point is the body's center of gravity, the center point of rotation. Good balance depends on good One-Point and everything else in physical technique depends on that. Focus on this point is called "having One-Point" or simply "One-Point." A shift or loss of One-Point can be as obvious as a fall or it can be extremely subtle requiring the assistance of uke to help detect its loss or misplacement. 1 m»le i ?ra ls familiar in English (badly garbled) as "harry-karry," ntual suicide committed by a cut (kin) to the abdomen and the hara up into a dangerous backward flip. Although it seems reasonable to lean forward while skating up a hill, it is always best to stay centered over One-Point. Eventually the skater discovers that power and speed come not by stroking with the feet but by shifting of the One-Point One begins to feci less like a runner on wheels and more like a pendulum; One-Point is the center of rotation. This dynamic stability is seen in several familiar children's toys. The Punching Doll, when struck, rotates around its One-Point to return to its original position.1 In Japan, similar dolls (Daruma) symbolize good luck, or at least persistence — the ability to keep coming back again and again despite adversity. The gyroscope is a highly stable spinning top. In engineenng applications it provides a stable reference point for navigation, helping to stabilize and diiect ships and planes. 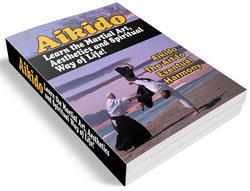 In Aikido, the One-Point offers the same stabilizing effect. It is thought of not only as the center of the body but of the universe. The idea is that since the universe is infinite, its center can be anywhere — so it may as well be at your One-Point — and for me, the center of the universe may as well be at mine. Whether physical or non-physical, this location can be placed and shifted through mind and attitude. Although we relax, drop weight underside and extend ki, we must always come back to One-Point. Maxine Wright recounts a story told by a retired military officer who, as an inexperienced young man, was so fascinated by the sight of his troops marching to his command that he didn't think to call them back until they were well out of earshot. The situation was rescued by his lieutenant. Regardless of the beautiful throw, the long soaring soccer kick, despite good fortune or adversity, keep One-Point. 1 Application of the same principles to the statues of Easter Island resolved centuries of myth and mystery surrounding the Stone-Age transport of 10- to 40-ton stone giants over many miles of rough terrain. See Heyerdanl (1989) or Shifflett (2000).